Coaldale MB Church, early 1930s. Source: Coaldale MB Church website. 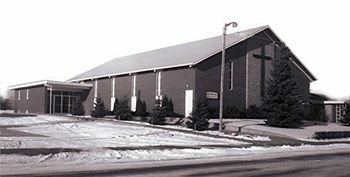 Coaldale MB Church, 1939-1971, ca. 1950. Digitized by Hiebert Library. Center for Mennonite Brethren Studies. 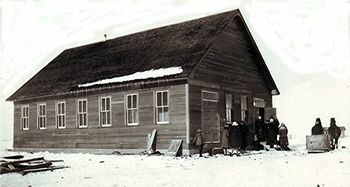 The Coaldale Mennonite Brethren Church began services and formally organized on 23 May 1926. Initially there was very rapid growth due to immigration from the Soviet Union. In 1928 the first church was built, but it proved too small from the beginning. Additions were completed in 1929 and 1932. By 1939 it was necessary to build a new and still larger structure with a seating capacity of 1000. The pace of immigration declined and members began to move to British Columbia or Ontario. Another building was erected in 1971. Klaas Enns is considered the founding leader of the group. Other leaders have included Frank Friesen, B. B. Janz, David Klassen, J. A. Toews, A. Dueck, A. Epp, A. P. Willms, H. Kornelsen and J. J. Unger. Coaldale is the first Mennonite Brethren church in Alberta, as well as the largest and most prominent. 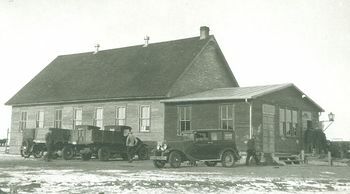 The Mennonite Brethren established Coaldale Bible School in 1929 and Alberta Mennonite High School in 1946. The congregation also founded the Coaldale Hospital in 1934. he congregation sponsored the radio programs called “Gospel Bells” (1952–1968) and “Brot des Lebens” (1960–1973). The transition from German began in the 1960s. The 1939 building became a museum in 1995 to house artifacts related to the history of the town of Coaldale. Esau, Frieda. "The Coaldale MB Church: A Brief History." MB Historical Society of Canada Newsletter (Jan. 1981). Fiftieth Anniversary of the Coaldale Mennonite Brethren Church, May 23, 1976. 1976, 52 pp. Gedenk und Dankfeier des 25-Jaehrigen Bestehens der Coaldale Mennoniten Brueder Gemeinde am 27. Mai 1951. 1951. Mennonite Brethren Herald (27 May 1988): 4; (30 June 1995): 20. Penner, Peter. No Longer at Arm's Length: Mennonite Brethren Church Planting in Canada. Winnipeg, MB: Kindred Press,1987, 178 pp. Available in full electronic text at: https://archive.org/stream/NoLongerAtArmsLengthMBChurchPlantingInCanadaOCRopt?ref=ol#mode/2up. Toews, John A. A History of the Mennonite Brethren Church: Pilgrims and Pioneers. 1975: 165-166. Available in full electronic text at: https://archive.org/details/AHistoryOfTheMennoniteBrethrenChurch. Toews, John B. With Courage to Spare. Hillsboro, KS, 1978. Church records at Centre for Mennonite Brethren Studies. Coaldale Mennonite Brethren Church, a member of the Northern District Conference, is located ten miles east of Lethbridge, southern Alberta. Nearly all Mennonites of this community have come from Russia since 1923. The first five immigrant families settled on "Lathrop's farm" in 1926. On 23 May 1926, 21 members met and organized this church with Klaas Enns as their temporary leader. Enns has justly been called the pioneer of the Coaldale Settlement as well as of the church. Soon the ministers Dav. Klassen, Jakob Wieler, and Frank Friesen came to Coaldale, and on 4 December 1926, F. Friesen took over the leadership of the church. The following decade was one of rapid growth, which is dearly seen from the history of the church building. In 1928 the first church was built (32 x 52 ft.), which proved too small from the beginning, so that additions had to he made in 1929 and 1932. By 1939 it became necessary to build a new and still larger church. The new structure (60 x 104 ft) has a seating capacity of about 1,000. In the last decade the flow of immigrants has decreased and a number of families have moved either to British Columbia or Ontario. The present membership (1953) of the church is 602. Church services as well as Sunday-school classes are held in the German language. The Sunday school had an enrollment of 395 children. Since 1929 a Bible school provides opportunities for the training of Sunday-school teachers and other church workers. At present it has an enrollment of 100 students who receive instruction under four teachers in three classes. Young people who desire a secular education under Christian teachers attend the Alberta Mennonite High School at Coaldale. The church has had capable and devoted workers, among whom B. B. Janz deserves special mention. His sacrificial services have been a great blessing not only to the local church, but also to the whole Conference and to the Mennonite people in general. Others who have faithfully served the church in various capacities are F. Friesen, David Klassen, J. A. Toews, A. Dueck, A. Epp, A. P. Willms, H. Kornelsen, and J. J. Unger. At present (1953) 13 ministers and 5 deacons serve the church. The leader is J. J. Siemens and the assistant leader is D. J. Pankratz. Janz, J. B. and Marlene Epp. "Coaldale Mennonite Brethren Church (Coaldale, Alberta, Canada)." Global Anabaptist Mennonite Encyclopedia Online. November 2012. Web. 22 Apr 2019. http://gameo.org/index.php?title=Coaldale_Mennonite_Brethren_Church_(Coaldale,_Alberta,_Canada)&oldid=163608. Janz, J. B. and Marlene Epp. (November 2012). Coaldale Mennonite Brethren Church (Coaldale, Alberta, Canada). Global Anabaptist Mennonite Encyclopedia Online. Retrieved 22 April 2019, from http://gameo.org/index.php?title=Coaldale_Mennonite_Brethren_Church_(Coaldale,_Alberta,_Canada)&oldid=163608. Adapted by permission of Herald Press, Harrisonburg, Virginia, from Mennonite Encyclopedia, Vol. 1, p. 631. All rights reserved. This page was last modified on 11 March 2019, at 02:03.